<span class='red'>[New Lower Price]</span> 8 Fr. <span class='red'>[New Lower Price]</span> 10 Fr. <span class='red'>[New Lower Price]</span> 12 Fr. <span class='red'>[New Lower Price]</span> 14 Fr. <span class='red'>[New Lower Price]</span> 16 Fr. 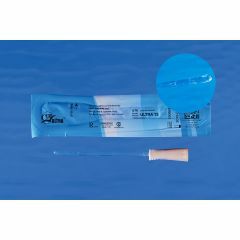 The Cure Medical Ultra Intermittent Catheter is a high quality DEHP and latex free product that always has fire polished eyelets that are smooth and less irritating. The sterile, single use Cure Ultra™ is a ready to use catheter for women. The small package features an easy tear top and enables disposal of minimal material. The Cure Ultra™ is offered with polished eyelets on a pre-lubricated straight tip and a unique, ‘No Roll’ connector/funnel end. The small packaging enables discrete carrying in a pants pocket or purse.